VicRoads and Major Road Projects Victoria have plans to construct a four lane strip of highway between the towns of Ararat and Buangor in southwestern Victoria, as part of its $672 million Western Highway duplication project. 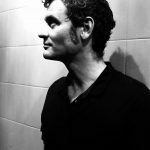 This basically means that the Andrews government proposes to build this part of the road next to a pre-existing section of the highway to cut down on three minutes of driving time, and in doing so, destroy around 3,000 trees, over 200 of which are sacred to the local First Nations peoples. 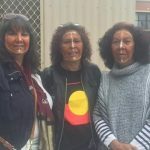 Currently, the project is on hold until the outcome of a mid-April Federal Court hearing is delivered, which involves the Djab Wurrung people appealing the decision of federal environment minister Melissa Price to let the project go ahead, as she’s decided the area isn’t of significance. 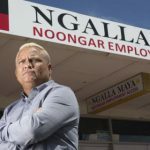 In mid-March, an application was submitted under section 9 of the Aboriginal and Torres Strait Islander Heritage Act 1984 (Cth), which requires the minister to issue an emergency declaration to stop a project if it poses a “serious and immediate threat” to a “significant Aboriginal area”. The Djab Wurrung Heritage Protection Embassy was established on 18 June last year to stop the destruction of the sacred trees and the land they’re situated on, as the site holds much significance for the local people. The sacred trees on this land include an 800-year-old birthing tree that has seen over 50 generations born inside the hollow of its trunk, as well as a 350-year-old directions tree that’s been shaped and resembles a woman. This area is part of a song line, and as the embassy asserts “the series of sacred trees and artefacts” found there “prove its significance”. And the sovereign people gathered on the land aren’t about to allow any bulldozers to move in and destroy their tens of thousands of years’ old culture. The Andrews government announced on 1 February that it was amending the route of the strip of duplication road to allow for the protection of two of the culturally significant trees, however those at the tent embassy maintain that the whole site is sacred. As Victoria police moved in to disburse the camp in mid-March, protestors successfully marched them back off the site. And this brought a halt to Major Road Projects Victoria moving in with its machinery and commencing work. And despite the claims of government, the Djab Wurrung people insist that there’s been no adequate consultation during the whole process, which has led to questions being raised as to how soon-to-be-entered-into treaty negotiations in Victoria will pan out. 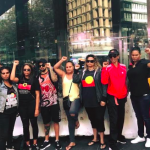 Sydney Criminal Lawyers spoke to Djab Wurrung Heritage Protection Embassy spokesperson Zellanach Djab Mara about the site’s significance, the embassy’s attempt to access documentation through freedom of information laws and their stance as sovereign peoples. Firstly, Zellanach, can you tell us a bit about why this site and the trees hold such significance for your people? When we talked about sacredness within life – or any kind of sacredness – we’re talking about this particular place. It’s a particular place where women give birth. It’s a place where women’s business is conducted. And that’s what we talk about: where women prepare for the birth of children. And it will destroy not just one particular tree, but many directions trees. After a birth, the father would have the placenta and the mother would have the seed from the bush tucker. They would go and plant a tree, which is called a directions tree. That tree would then represent that baby. And that baby would grow in conjunction with that tree. So, that’s there for that child to go back to and reflect on their life. However that tree grows is a direct reflection of how that child is growing – that child’s life. Major Road Projects Victoria has agreed to halt any proceedings on the highway project until after a Federal Court appeal this month. What does that entail? We’re appealing the minister’s decision to give the go ahead to the project. The government’s position is still the same, no matter what happens in the Federal Court. There are a couple of other sections that we have to apply for, under heritage protection. The Victorian minister for transport infrastructure Jacinta Allan stated in February that the project will still go ahead. Although, she said it’s been modified due to the concerns of the embassy, so that eight trees will be saved, which include two culturally significant trees. What do you think about that concession from government? That’s an absolute cop out. They go away and conduct their little modifications amongst themselves. Then they call a meeting with an agenda and call us into the meeting, as if we’re having some sort of input around the modification. Quite frankly, eight trees, as opposed to in excess of 200 culturally modified trees in this area, just doesn’t weigh up. Not only that, it’s also the landscape that those trees sit upon that’s sacred. 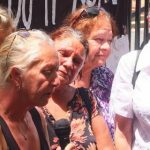 When the project was being developed, what sort of consultation did the Andrews government undertake with the Djab Wurrung people? None. No consultation. That’s why we came in when they were pretty much ready to start work. We didn’t have any consultation within that. When we sent freedom of information requests, the pages came back blank. Major Road Projects Victoria and the government know they’re in breach. They know they’ve done wrong. They’re just too pig-headed to apologise and to make wrongs right. Three weeks ago, police were sent in to remove your embassy days prior to Major Road Projects Victoria moving in to begin work. But, your embassy pushed them back. What happened there? We’ve got the spirits on our side. We’ve got a lot of support from a lot of people. We know we’ve followed process. We’ve followed due diligence. We’ve followed all of the legalities. We’ve remained strong, united and peaceful. And within those three elements together -which is the spirit of our old people – and with the guidance of our elders, we were able to get them to retreat. Back in 2017, there were plans to stop the project. Aboriginal Victoria was to investigate the birthing trees, and if they were verified, then the site would be protected under the Aboriginal Heritage Act 2006 (VIC). But, the trees haven’t been protected under state laws. Why hasn’t this happened? These trees were marked 25 years ago. And over time, the paperwork has gone missing. 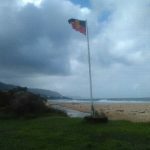 But, not only that, one of the organisations who holds the RAP, as we call it – the Registered Aboriginal Party – we think they’ve signed off and deemed this part of the area insignificant. The Djab Wurrung Heritage Protection Embassy was established on 18 June last year. What’s the set up like? And how many people are gathered at present? In excess of 30 or 40 people at the moment in between three camps. On 25 March, the Victorian Trades Hall Council threw its weight behind your action. It released a statement calling for the sacred trees to be saved and the situation to be resolved. How is the support for your campaign growing in the wider community? It’s grows daily. We get visits daily. We get inundated with messages and phone calls. So, we’re growing rapidly. And people’s spirits are starting to receive the message about what’s happening. And for those out there in the community who want to lend support, how can they do that? There are many things they can do. They can keep coming to camp. They can keep donating. They can donate supplies. And they can just keep helping in whatever capacity they feel that they can help in. And lastly, Zellanach, the project is on hold. You’re waiting to see if the Federal Court will reverse the decision of the environment minister. What do you see happening from here? What’s your next move? We’re not going anywhere. We’ve asserted sovereignty. What we have done here is a reclamation of our sacred land under the rule of sovereignty. We’re in a space of really educating the system. 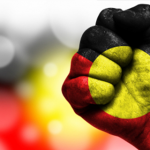 If you would like to donate to the Djab Wurrung Heritage Protection Embassy, you can do so here.